May 30, 2017 May 30, 2017 Dan O.
Four-star General Glen McMahon (Brad Pitt) is one of the most respected men in the Army and it’s why all of the men that he surrounds himself with, not only just stand by every word he says, but also seem to have his back no matter what. Which is why when he’s sent to Afghanistan to bring the war to an end, they can’t help but do whatever it is that he asks of them. But it’s a rough situation McMahon and his men find themselves in; for one, they have to do the impossible tasks of stopping insurgencies for constantly forming and killing people. Second of all, they have to ensure that the politicians the U.S. wants in Afghanistan’s office, actually do get elected, so that they can promote “peace and tranquility”, despite the fact that the U.S. actually invaded Afghanistan in the first place. All that said, McMahon is a class-act and more than up to the task, but after a short while, even he finds himself on the receiving-end of all sorts of screw-ups that don’t seem to be coming from his directly, but somehow, he’s getting the blame for. When is he going to crack? War Machine is an odd movie in that it’s no doubt a satire on the war in Afghanistan, and how the U.S. clearly had no idea how to end its conflict without looking dirty, mean and downright brutal, but it’s also a movie that tries to go a bit deeper and ask us how we get there in the first place. In that sense, the movie doesn’t quite work; War Machine is a movie that’s far too enamored with its silly, sometimes off-the-wall characters and the situations they find themselves in, to really get all that involved with what really causes war and conflict between two nations to begin with. Sure, are those ideas played with here? Yes, they are, but they almost seem like they don’t go far enough to really stick the knife in and twist it, like all good satires do. You know, like Three Kings, for starters. But hey, War Machine isn’t Three Kings, which isn’t a good thing, or a bad one – it’s just a thing. They’re both satires that make fun of the war, as well as the people who find themselves wrapped-up in them, but the former clearly has a certain angle it’s wanting to take, getting down into the PR-side of it all. In fact, War Machine does work best when it’s trying to develop just how a country can look when they’re not just trying to end a war they sort of started, but just how they can do it all without looking like the evil and maniacal beings that they probably are. It’s an interesting conflict that already sits next to other interesting conflicts to be seen here, but it also makes me feel like War Machine could have been longer. Then again, at two hours, the movie doesn’t feel long, nor does it ever really drag. It moves, even if it can’t always figure out a perfect tone to stick with, but that’s normal with most satires. Having fun and making jokes are easy to do, but when it comes to turning that other cheek and getting all serious, then yeah, it’s a little bit more difficult. That said, writer/director David Michôd does a solid job here transitioning between the many threads of plot and tone, even if by the end, it still sort of feels like it may have benefited from some more developing on certain ends. For example, while it was nice we got see some heart and humanity behind Pitt’s McMahon, where was everybody else’s in this insanely-stacked cast? After all, the movie does sort of pride itself on the fact that McMahon’s surrounded by this rag-tag group of goobers, who may also be efficient at their jobs, or may just be good enough that McMahon lets them slide on doing rather dumb stuff. In fact, a much more developed and concise movie probably would have kept the focus fully on this group alone and sort of had all of the other stuff go by the waist side. Because, yeah, when you have Anthony Michael Hall, John Magaro, RJ Cyler, Tilda Swinton, Ben Kingsley, Scoot McNairy, Will Poulter, Griffin Dunne, Alan Ruck, Emory Cohen, Keith Stanfield, and hell, even Topher Grace here, feeling as if they’re maybe, I don’t know, a bit dumped around, it’s a shame. But hey, at least Pitt’s good, right? As always? Right? Well, actually yes. See, while all of the reviews have been criticizing his role as just another goofy and rugged take on Aldo Raine, but this time, older and with grayer hair, it actually worked for me. In a way, it was nice to see Pitt take on a role that was clearly meant for an older fella (which he is), in which he gets to be both charming, as well as a little stern. Some of his mannerisms are a bit over-the-top and maybe put-upon, but it’s hard to get annoyed by them after awhile, especially once we see this character away from the spotlight and just chatting it up with those around him, especially in the lovely, yet, rather sad scenes he has with his wife, as played by Meg Tilly. Pitt may be playing a character here for sure, but he tries to go deeper and the movie helps him in that regard. Is it his finest hour? Nope, but hey, it’s still a joy to watch. 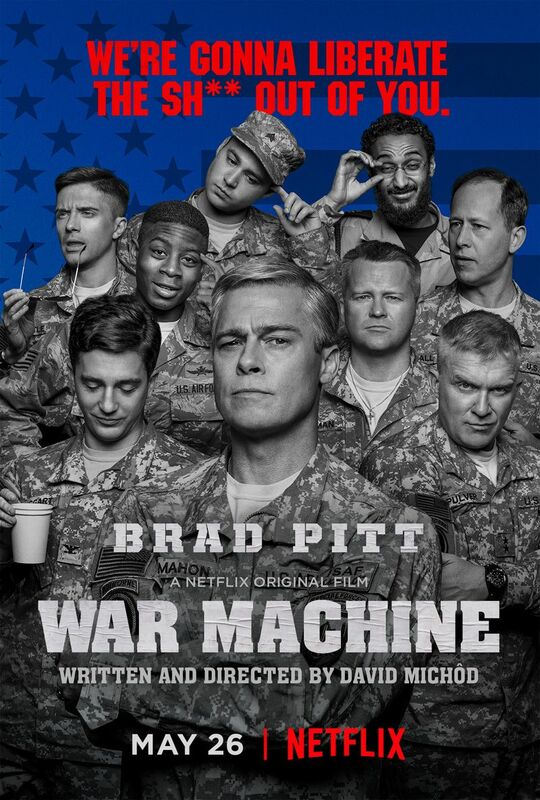 Consensus: Tonally uneven and a bit underdeveloped, War Machine could have benefited from some more time, perhaps, but thanks to a smart message and solid cast, it goes by easy. Still muggin’ it, eh Brad? Good review, Dan! I’ve been hearing so-so things about this one. Shame, because Netflix Originals seem to be aiming for quantity over quality in 2017.